The Firebirds are stirring it up today with some fun on Fiction Friday. Stop by and read our quick part 1 of Another Time–an original short story where you get to decide what happens next. Come on over and cast your vote, we won’t know what you want to see happen with Olly and Nick without your input. I know my posts are directing you over to our group site, but, well, we are so pumped about this new opportunity to reach out to people who enjoy the warm fuzzy feeling you get from reading a happily ever after. Make us your daily dose of “aaahhh” and you won’t regret it. We’ll announce the winners of the Starbuck’s gift cards this weekend in appreciation for helping us make this the greatest blog launch ever. Can’t wait to see you there and find out who you want to walk in the door. This week is our launch and we’d love to have you stop by and share with Kat ways you discover new authors or check out how some of us and our friends find these debut gems. We are going to offer so many fun and exciting things. We’ll be talking about favorite books, favorite heroes, favorite first lines. We’ll offer advice in a “Dear Firebirds” feature, and the one we are all so proud to include is Fiction Fridays where we start a story and let you, our readers, vote on the next turn in the story. So, come on by and say hello. We can’t wait to see you. I’m not just saying that because my life appears all rosy and perfect right now–I finaled in another contest at the chapter level with my second manuscript. But that does help keep me smiling. I have issues and crises of faith, and temptations to lose my temper assail me just like you. But if we can put our trust in Him before we get out of bed each morning, then we will have a day filled with His presence and His assurance. We may still encounter a snag or an unhappy person, but we won’t do it alone. And with God walking beside us into battle, what else do we need? Be brave. Be strong. But be faithful first and the rest will be easier. He is always with us. We are most richly blessed. 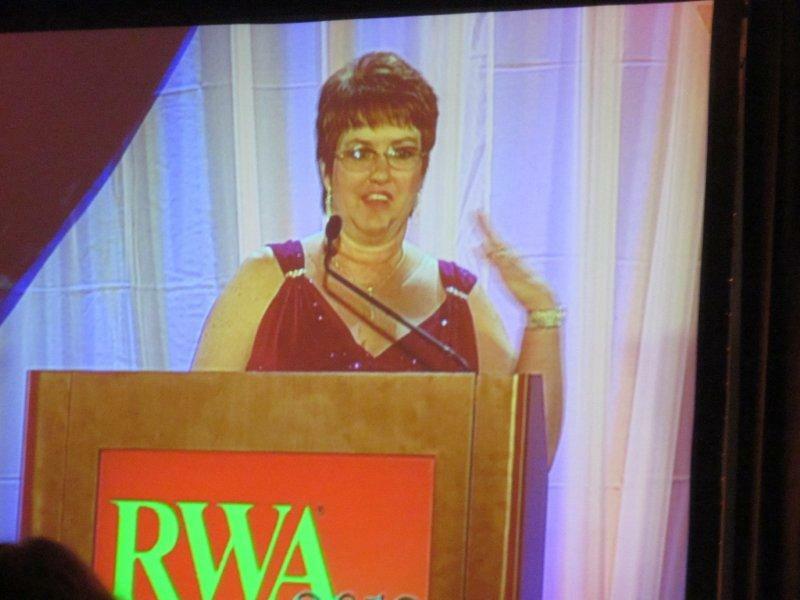 Me, after being named RWA 2012 Golden Heart Winner in the Inspirational Category. Thank you Joni for capturing the moment. I was so stunned when I received the call from Maggi Landry on March 26th letting me know I had finaled in RWA’s Golden Heart Contest. And I was shocked when they called my name as the winner for the category on July 28th. I already counted myself a winner just for finaling. That was a true validation that all my hard work and writing had not been for nothing. That this dream could come true, but some time in the future–way in the future after this year’s winner was annouced because I had read at least one of those stories that was my competition and knew how great it was. Besides all three of the others had sold and I hadn’t. (But I also hadn’t submitted to an editor yet either.) There was no way I would win. It was just insane. Well, insanity must have ruled the night–at least in the inspirational category for the GH. It is an honor to win my category and it is a privilege to call these fine women my sisters. We have forged a bond over the past four months that distance (all the way down to Australia and over to Hungary and India) nor time can erode. We will survive, we will encourage each other, and we will soar higher than anyone thought we could–straight to the bestseller’s lists all over the world. Thank you everyone for sharing in this amazing dream come true. It was the most magical night of my writing life. I will treasure it always.